Lorena High School seniors look over bones in class. With 58 percent of last year’s graduates rated “college ready,” Lorena led the pack among public schools in the county. A majority of 2018 high school graduates did not test “college ready” on college entrance exams, according to an analysis of Texas Education Agency data by Hearst Newspapers. Lorena High School seniors Mabrey Walters and Riley Mitchell work in their AP biology class. With 58 percent of last year’s graduates rated “college ready,” Lorena led the pack among traditional public schools in McLennan County. With 58 percent of last year's graduates rated "college ready," Lorena led the pack among traditional public schools in the county. At Midway High School, in the county’s largest A-rated public school district, less than half the 2018 graduating class scored high enough on college entrance exams to be considered “college ready,” according to an analysis by Hearst Newspapers. 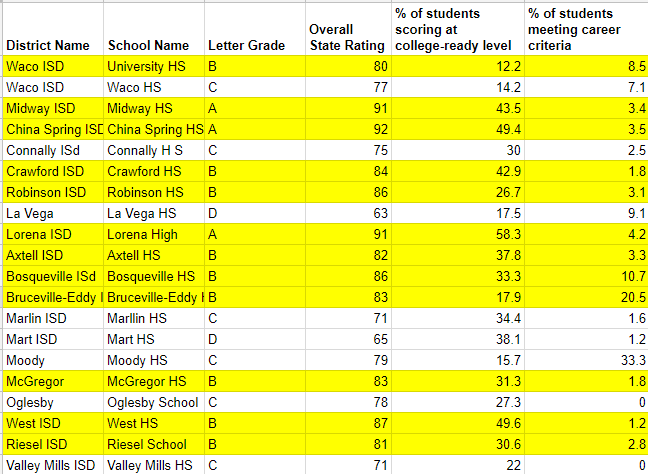 But Midway’s class with 44 percent of graduates rated as college ready is not an outlier for Texas. Two thirds of schools with the equivalent of A or B ratings assigned by the state had 2018 graduating classes with fewer than half the students meeting college readiness standards based on ACT or SAT scores, the analysis found. Rapoport Academy’s high school saw 90 percent college readiness, and Lorena High School led the pack among traditional public schools locally, with 58 percent college readiness. Scores below the college readiness threshold mean more students are likely to need remedial work when they start college, and that has been the case for Midway graduates attending McLennan Community College, said Ashley Canuteson, Midway’s director of college and career readiness. Data for the past five years show more Midway graduates at MCC are taking developmental classes in their first year of college, Canuteson said. To counter that development, Midway has implemented strategies to identify and support student academic needs before they leave high school. “We focused in at Midway, just last year we started to really emphasize instructional support in our English and math courses to better prepare students for success on those three tests — the TSI, ACT and SAT,” she said. Midway covers the cost of the Texas Success Initiative assessment, which gives students an idea of where they stand before they start their senior year, she said. “That allows us to gauge where they are in those areas and if they need additional supports, so we can respond to that instructionally, so if they do pursue any type of college after high school they can hopefully start on level and not have to take remedial coursework,” Canuteson said. Lorena Superintendent Joe Kucera said the culture at the Lorena High School created by Principal Kevin Johnson has contributed to students’ success on college readiness ratings. The school holds informational college nights for parents and students to learn about college options, entrance criteria and financial aid, and college spirit is part of every school, Kucera said. “You see our teachers wearing their college gear and you’re seeing everybody’s support for their college. … We really play the college piece up,” he said. Kucera said Johnson was ahead of the curve in his decision to offer TSI exams at Lorena High School years ago. Though it had more graduates rated college ready than other local schools, the district continues to look for ways to be better, Kucera said. He said his focus will continue to be what is good for the students and the community, not an ever-changing accountability system or a letter grade. “I’m happy to have an A but you don’t see me out there bragging about it. … I don’t think that it (the accountability system) is fair because some of the stuff that happened at Waco ISD, getting four schools off the (Improvement Required) list, if that’s not “A” work I don’t know what is,” he said. While working to meet performance goals, it is important to prioritize students’ needs, he said. “My advice (to school districts) would be to listen to your kids and try to provide what they’re looking for. Part of the problem is we have all these adults making all these accountability rules, but is that what’s best for kids? I don’t know. We should ask our kids. We don’t always do that,” Kucera said.